A monument of former Russian communist leader Vladimir Lenin in the style of the Minecraft video game has been erected in the Siberian city of Krasnoyarsk. The pixelated cardboard statue was unveiled last week as part of an art project and stands on top of a platform at the entrance to the Krasnoyarsk Museum Center, which was named after Lenin until the Soviet Union collapsed in 1991. It depicts the Soviet founder, dressed in a black suit and red tie, striking his signature pose of an outstretched arm pointing into the distance. 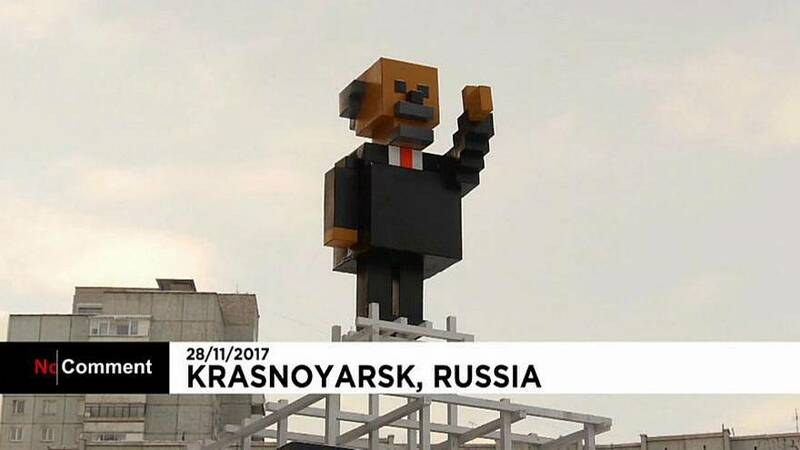 The creator of the Minecraft Lenin, local artist Aleksandr Zakirov, told Russian media that the monument was meant as a tribute to Lenin’s “visual image”. He added that he expects it to disappear within a month, as the cardboard structure gets softened by the snow. Images shared on social media showed people rushing to snap photos of the Russian revolutionary, and posing alongside him. However, not everyone has embraced the statue. The leader of Krasnoyarsk’s Communist Party told Govorit Moskva radio station he would demolish the monument, describing it as a mockery of the mastermind of the 1917 Bolshevik Revolution. Lenin served as head of government of Soviet Russia between 1917 and 1924, and of the Soviet Union from 1922 to 1924. Under his administration, the Soviet Union became a one-party communist state.